Happy Spring (finally) to one and all. The First Quarter of 2018 has closed, so let’s examine the real estate activity on-Island thus far and allow us to offer some comments for your consideration. Since the holidays, the early winter weather was relatively mild and contributed to some quick, successful transactions. But more recently, Mother Nature has delivered several late season storms that have significantly impeded the normal and customary real estate activities on-Island. Despite the carry forward in positive buyer interest from the fall, if it wasn't the weather, it has been the disruption in ferry service provided by the Steamship Authority that has contributed to the slow start to the season. 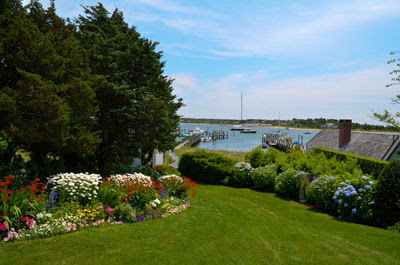 Prospective buyers simply have had too much anxiety toward making any early season due diligence trips for fear of getting stuck on one side of Vineyard Sound or the other. However, now that ferry service ills are resolved, and warmer temperatures are surely closer at hand, the positive sentiment realized from the fall toward vacation/second home acquisition will resume more comfortably. And given the maturing spring calendar, we anticipate having more busy weekends ahead, being in the field with prospective buyers pursuing investigative activities toward finding an Island property before summer arrives. Continuing with the strong market dynamics of last year, many of the same variables we espoused during the past three seasons continue to exist here in early 2018, but perhaps with a greater sense of urgency. 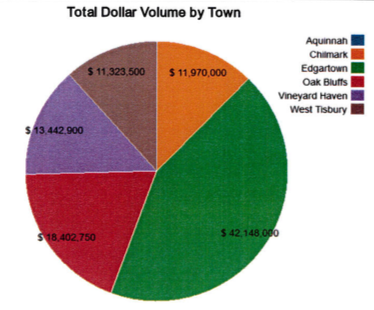 For several years now, the Vineyard market has meandered along in a “not too hot, not too cold” type behavior regarding the annual volume and realized prices of sold properties. However, while attractive mortgage options are still available, they are becoming more sensitive to interest rate increases. And as the Island inventory increases from the off-season lows, the amount of new units are likely to be tapered in number given the voluminous turnover we’ve already experienced during the past several years from this finite market of properties. Much as the closing months of 2017 demonstrated, the median price on-Island has established a "sweet-spot" for sales transactions during the first quarter, which has fallen within the $500,000-$900,000 price range. By far, this is the most active segment of the market and therefore continues to deplete much of the available inventory. And while the higher price segments offer many options within each of the Island towns, pricing remains critical, even in an active market. "Blue-sky" pricing of a decade ago is not proving to be as effective a strategy to attract buyers given our competitive market condition. The National Association of Realtors (NAR) reported that existing nationwide sales have continued in an upward trajectory, albeit with tapered enthusiasm, as available housing inventory is contracting. Their chief economist, Lawrence Yun, suggested that the expanding pool of buyers nationwide amidst a dwindling number of available properties has led to a tighter supply and therefore increased sale prices. With another spring market now upon us, it remains to be seen if the Vineyard will feel similar correlating effects after the strong transaction volume we have conveyed consistently since 2015. But for prospective buyers of the Island, it is important to recognize that the Vineyard continues to "normalize" and emulate many of these same competing characteristics found off-Island. With high interest and increased demand for Island real estate, but lower levels of available inventory to consume, prospective buyers should expect to see higher market prices through the balance of this year. For consecutive years now, current inventory is below winter holiday levels, which is often the most quiet period of the year. Last year at this time, there were 451 total listed units. As of this writing, there are 406. As aforementioned, there likely will be an influx of listings forthcoming to participate in the “spring market”, once the warmer weather firmly arrives. 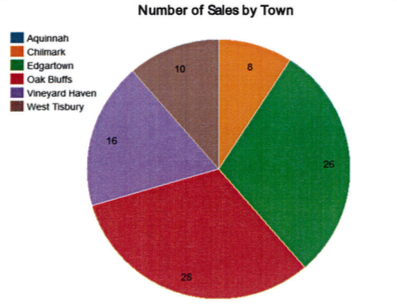 But there is a marked change in the complexion, volume, and pricing of properties found within the various segments of our micro-market. Therefore, prospective buyers will need to remain vigilant this spring and keep their eyes peeled for new supply coming to market, and be equally prepared to act promptly. For your consideration, here are the more meaningful statistics from activity realized during the First Quarter of 2018. A total of 88 residential properties were sold among the Island towns within the First Quarter this year, which is one less than was sold a year ago for the same period. Edgartown-26, Oak Bluffs-28, Vineyard Haven-16, West Tisbury-10, Chilmark-8, and Aquinnah-0. Median sale prices on-Island for Q1 decreased approximately 2% from $759,000 to $745,000 compared to the same period in 2017, and average sale prices decreased by approximately 14% from $1.292M to $1.106M for the period. On average, residential property sales captured 96.5% of their final asking prices and garnered 118% of their respective tax assessments. However, the strength of this correlation remains highly subject to factors such as condition, amenity, scarcity and uniqueness of the subject properties sold. As an independently owned franchise that is associated with a national brand, we are often introduced to proprietary market analysis and industry trends. We’ve thus learned that resort-vacation-destination markets like Martha’s Vineyard have continued to enjoy consistent attention and acquisition, but also significant heightened competition for these desirable properties. So for those who have vested themselves in the search for Island real estate, 2018 may again afford the opportunity to make the commitment toward acquiring an Island property. But preparation, education and timing are becoming important variables. And for current home owners to consider, because the better conditioned and more realistically priced inventory has been consumed in 2017, this year could prove to be an opportune time to list and successfully sell your Island property given the present steady demand. Please contact us to discuss performing a market analysis and Broker Opinion of Value of your property. With over 30 years of market experience, we are able to counsel our clients well. If a purchase of an Island property is not in your future right now, there is still time to book your 2018 summer vacation rental. Our inventory continues to grow featuring homes that accommodate most every need and represent every corner of the Island. But availability for best properties and weeks are waning. Please contact us to assist you in creating your dream vacation! Please visit www.mvlandmarks.com to view a comprehensive list of all available Island listings for sale or vacation rental. And as always, please do not hesitate to contact us with your questions and curiosities concerning properties of interest or Martha’s Vineyard real estate in general. Summer is coming to the Vineyard, might YOU be coming to your Island home?? ?